BHOPAL: The officers and employees belonging to the general category, OBCs and minorities in Madhya Pradesh are angry with the State Government as it is siding with employees belonging to the reserved SC/ST categoeies and following the policy of appeasement towards them. This was pointed out emphatically by Dr. Anand Singh Kushwah, president of “Samanya Pichda evam Alpsankhyak Varg Adhikari Karmchari Sanstha” (SAPAKS) at a press conference in the State Capital. The SAPAKS President accused the Government of resorting to delaying tactic to prolong the hearing in “Reservation in Promotion” case at the Supreme Court level. Taking a dig at the Government for using money power in the Reservation in Promotion case, Kushwah cited news reports to point out how the State Government was spending Rs. 25 lakh to Rs. 50 lakh per hearing and said that the Government owes an explanation and will have to tell what about its responsibility towards those belonging to the general category, OBCs and minorities. He also asked why the Government, instead of protecting and taking equal care of all sections of the people under the letter and spirit of the Constitution, was only serving its vote bank. Kushwah said that there was a ray of hope for the general category, OBC and minority employees after the Jabalpur High Court declared as null and void and scrapped the special provision (Madhya Pradesh Government Rule of 2002) for granting reservation in promotion to the SC/ST employees, reserving vacancies and managing the rosters which was brought in force to implement the Dalit agenda by the previous Congress government led by Digvijay Singh and was being implemented continuously. The present State BJP Government has challenged the High Court order and this is the first time it was pointed out by SAPAKS that any State Government is funding an Army of lawyers to represent it in the Apex Court. Founder of SAPAKS A.K. Jain, who was also present, briefed media-persons about the status of the ‘reservation in promotion’ case in Supreme Court. Dr. K.S.Tomar, also a founder of SAPAKS told the journalists about the injustice and endless suffering they were going through due to the reservation policy. He said that irrespective of the confidential report and despite facing charges of indiscipline, many of those in the reserved category have got promoted in various departments and the brilliant and deserving officers were stagnating on the same post. He particularly said those junior, and lacking in performance have got promoted to top posts in many departments while the senior and efficient officers are languishing on the same post This is adversely affecting the administrative efficiency, he added. 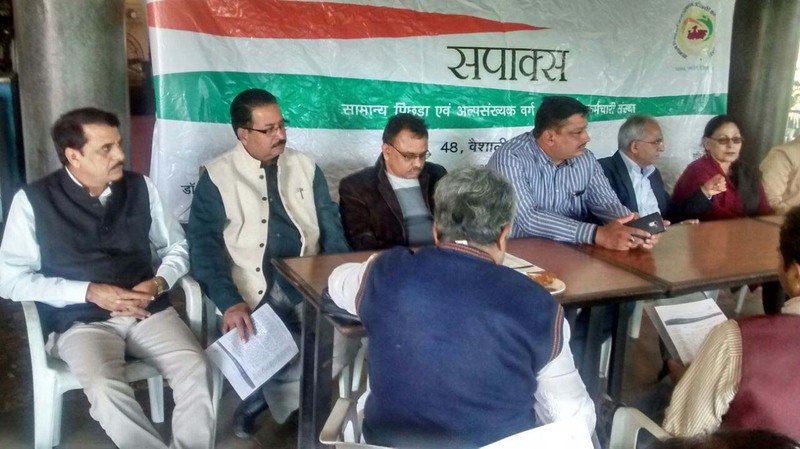 Jointly addressing the media-persons, Lalit Shastri, the president of “Samanya Pichda Alpsankhyak Kalyan Samaj Sanstha” (SAPAKS SAMAJ representing the general category, deprived and economically backward sections and minorities) and a senior journalist, said that his organisation formed by leading members of society, would be launching a state-wide drive to keep the public informed about the pitfalls of the reservation in promotion policy. He said that the people are concerned and want its immediate scrapping since it is adversely affecting administrative efficiency. Shastri also underscored the Constitutional position and gave a brief account of how the Madhya Pradesh Government provision for reservation quota, introduced using Article 335 and 309 of the Cosntitution and the reasons cited by the High Court to declare it as null and void. Shastri said that he would like to appeal to the State chief minister that he should not discriminate between different sections of government employees and under no circumstances money from the state exchequer should be spent on taking up a case in the Supreme court in support of a perticular section and against the interests of a vast majority of government employees. The press conference was also a curtain raiser for a “Maha Adhivesan” (State level convention) of SAPAKS office bearers in the State capital tomorrow. On this occasion SAPAKS Samaj will start its membership drive and also launch its website.